Romania will become a member of the European Union in 2007 or 2008. This paper explores the potential impacts of this step on Austria in three major fields: foreign trade, FDI and labour market. Romania is a more backward country than those which joined the EU in 2004, but it has been on a path of rapid economic growth since 2001. The medium-term prospects of its economy depend of two main factors: restructuring and improving international competitiveness, and the capacity to absorb EU funds after accession. If progress is slow in both respects, economic growth will be around 4% annually in the coming years, while under favourable conditions it may climb to 5-6%. Romania will remain a rapidly growing market for investment goods, consumer goods and services alike providing good opportunities for Austrian companies. Trade flows between the two countries are modest: in 2004 Romania ranked 16th regarding Austrian exports and 21st regarding imports but is has been increasing rapidly in recent years and one may expect further strong growth. Austria enjoys a current account surplus vis-à-vis Romania. The bulk of the surplus is generated by trade in goods, most recently also through the incomes earned by Austrian subsidiaries. Migrants’ transfers from Austria to Romania are of a low magnitude, which indicates the lack of substantial migration. The recent huge investments of OMV and Erste Bank result in an Austrian FDI stock of about EUR 6 billion by the end of 2006, some 10% of the Austrian outward FDI stock. This is a similar amount as invested in the Czech Republic or Hungary, which had been the main targets in earlier years. But compared with those countries, Austrian FDI in Romania is more concentrated in a few companies and industries, and the subsidiaries in Romania are less export-oriented. We conducted a questionnaire survey in February 2006 among Austrian companies with subsidiaries in Romania in order to find out the impact of investments in Romania on Austrian mother companies. The most important impact was that the firms’ turnover increased. In the majority of cases, also employment increased in Austria, particularly in the field of management and services. The survey results confirmed that for Austria the internationalization of activities and the penetration of the Romanian market bring more benefits for employment than job losses due to relocation. Austrian companies plan further investments in Romania after that country’s accession to the EU. All respondents mention some advantage of enlargement, at least in the form of easier border crossing and more EU-financed projects. 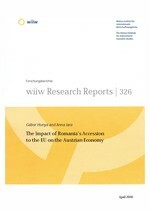 Only few companies expect a negative impact in the form of increasing labour costs in Romania. Immigration of Romanians to Austria amounted to around 39,000 persons (legal, net) during the 15 years from 1990 to 2004. In 2004, about 5500 entries of Romanian immigrants were registered, while 3500 Romanians left Austria. The difference of about 2000 persons accounted for 3.3% of net immigration to Austria in that year. Most of the Romanian nationals who immigrated to Austria in the past 15 years have established a long-term living here. Romanian employees in Austria face a slightly higher probability of unemployment and receive lower earnings than Austrian nationals. To assess the expected size of immigration from Romania to Austria in the case of free labour mobility, we discuss existing studies based on both econometric analysis and survey findings. We find that a total number of around 43,500 Romanian nationals can be realistically expected to move to Austria in the first ten years after the introduction of free labour mobility. This is 1.3% of Austria’s 2004 labour force (without the self-employed). But, EU accession will by far not mean free labour mobility. Transitional arrangements will restrict Romanian citizens’ right to assume employment in most incumbent EU member states including Austria. The main mode for Romanian citizens to legally enter the Austrian labour market will remain to be via work permits that are issued for sectors with excess labour demand only.